Some people make a habit of denigrating Twitter, saying that its well-known 140-character limit makes it useless for anything substantive. There are several responses. First, it’s possible to link to anything on the Web within a tweet (just use one of the common URL-shortening utilities), so lots more information can be conveyed. Second, a lot of people read more on Twitter than they write. They use it as a sort of personal news feed, scrolling down for a few minutes at a time during the work day to see what’s new. If you pick the right accounts to follow, this works very well. It’s true, though, that A2L Consulting receives far more traffic on its website from LinkedIn than from Twitter. I recently commented on this reality for the Wall Street Journal. So my advice to litigators is to pick a small number, say between 30 and 100, high-quality Twitter accounts to follow. Here are 50 that I recommend, but there are many more good ones. I have tried to provide a balance among news sources, trial tactics, general legal news and other interesting accounts. Click on any of the hyperlinked Twitter handles below to open a new window where you can chose to follow that account. AP Courtside Seat @AP_Courtside - Go courtside as The Associated Press covers the Supreme Court. Bloomberg Law @BloombergLaw The first legal and business intelligence resource to deliver integrated legal research, premium content, news and proprietary world-class business data. American Bar @ABAesq The American Bar Association provides resources to assist lawyers and judges, accredits law schools, and works to improve the legal system for the public. A2L Consulting @A2LConsulting Yes, that's us. Since 1995, jury consulting, litigation graphics, and trial tech to litigators from all major law firms on 10K+ cases with trillions at stake. ABA Journal @ABAJournal Continuous news updates from the United States’ most-read and most-respected legal affairs magazine and website. N.I.T.A. @NITACentral NITA's mission is to promote justice through effective & ethical advoacy by training and mentoring lawyers to be competent & ethical advocates. JD JOURNAL @JDJournal Legal News, Law Firm News. Above the Law @atlblog The widely read and often hilarius legal blog of Breaking Media. The Am Law Daily @AmLawDaily The source for daily legal business news and analysis of leading law firms. National Law Review @natlawreview The National Law Review is a free on-line resource of legal articles written by leading law firms & agencies. Ron Coleman @RonColeman Commercial law focusing on trademark, copyright and litigation. Writer of the LIKELIHOOD OF CONFUSION® blog. Richardlevick @richardlevick Richard Levick is Chairman and CEO of LEVICK, the nation's leading crisis communications and high stakes public relations firm. Greg S. Wilson @GregSWilson Attorney. Interested in innovative ways to deliver legal services. Tammy Metzger JD, MA @JuriSense Trial consulting & Prepare to Win workshops approved by David Ball. Formerly in-house @ plaintiffs' firm, ad. editor @TheJuryExpert, UC instructor & researcher. Kathy Kellermann PhD @KKComCon ComCon Trial & Jury Consultants. Experts in human side of litigation. Science, research, experience & skill make cases compelling for motion, settlement, trial. Geri Dreiling @legalmediamtrs I'm a lawyer and journalist who now provides legal PR and content writing services. Editor of Lawyer Tech Review: @lawyertechrvw. Lee E. Berlik @LeeBerlik AV-Rated Business Litigation Lawyer. Virginia attorney handling contract disputes, intellectual property matters, defamation claims, and more. Lisa DiMonte @lisadimonte Global court reporting, videography, videoconferencing and litigation support. Your emergency becomes our emergency. Loves cooking and traveling! Justia @justiacom Justia works on free legal information & community projects, including free case law, codes & regulations databases & lawyer, law blog & twitterer directories. Jonathan D. Roy, Esq @jonathandroy I am a Massachusetts attorney that specializes in #eDiscovery,#predictivecoding, and #analytics. I have a background in #litigationand #analytics software. Marilyn Bush LeLeiko @LawWriting Conducts writing skills training at law firms and at corporate and government legal offices. Works with lawyers (CLE programs), paralegals, managers and staff. Robert B. Smith @BobSmithLaw trial lawyer and trusted advisor to businesses, institutions and individuals. at DeMoura/Smith LLP Boston. Katherine James @actlaw Trial & Litigation Consultant, Witness Preparation, Attorney Workshops, CLE, Applying theater and acting skills to the Law. Law Practice News @Law_Practice Follow us for Law Practice articles, blog posts, and related writings by lawyers, law firms, and legal professionals. A @JDSupra law content feed. Morgan C. Smith @cogentlegal Compelling graphics and strategic consultation for attorneys in all phases of litigation. Founded by a top-rated trial lawyer with multimedia expertise. David Tate @DavidTateEsq Writes about a wide variety of legal topics. Litigation Solutions @LitigationSolns Providing litigation support services to attorneys since 1994. Multimedia trial presentation specialists. Mitch Jackson @mitchjackson California lawyer who enjoys social media, trying cases and sharing 27 years of communication tips! Kevin O'Keefe @kevinokeefe Lawyer. CEO/Founder of LexBlog: Empowering lawyers worldwide to network through the Internet. ASTC Prof Visibility @ASTCNow Informing trial advocates of the opportunities for advancing their skills. A publication of the American Society of Trial Consultants (ASTC). Lawyerology @lawyerology Lawyerology: the art and science of being a lawyer. Blog edited and written by Rob Sullivan and the lawyers/staff of Sullivan, Morgan & Chronic - Trial lawyers. Law.com @lawdotcom ALM's Law.com is the web's leading legal news and information network for attorneys and other legal professionals. ABA Litigation @ABALitigation The American Bar Association Section of Litigation serves 60,000 members! Mark Hamill, JD, CPA @Mark_Hamill_Esq Accomplished and energetic attorney with Am Law 100 and Big 4 CPA experience. Legal Week @LegalWeek Legal magazine and website providing news on law firms, lawyers, company legal teams and legal developments, plus blogs, briefings, jobs, comment and opinion. Christopher Levinson @ChrisLevinson Administrator for Vititoe Law Group (prior firm was Masry & Vititoe). M&V was depicted in the film Erin Brockovich. BlawgWhisperer @BlawgWhisperer ABAJournal.com Web editor and keeper of the Blawg Directory. WSJ Law Blog @WSJlawblog Hot cases, emerging trends and big personalities in law from The Wall Street Journal. 22 Tweets @22twts Helping lawyers tell their stories, one tweet at a time. Bob Ambrogi @bobambrogi Lawyer, writer, consultant. 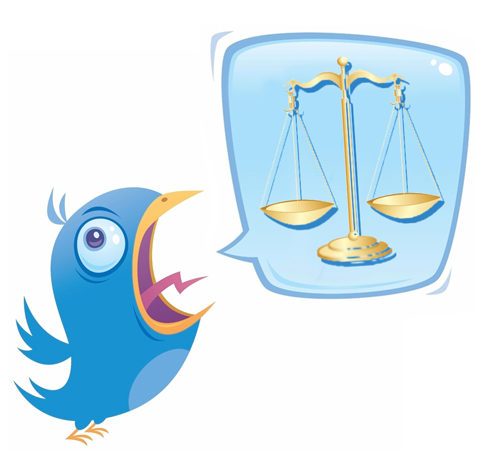 Please share other great Twitter accounts for lawyers, litigators and litigation support professionals in the comments below.